45mm titanium and steel case, transparent back, sapphire crystal, black dial with gold gear train, Caliber UN-205 manual-winding movement with hour and minutes indicated by the rotation of the movement, winding by rotating the back bezel, and time set with the front bezel, approximately 7 days of power reserve, black sailcloth strap with gold bar tack loop stitches, folding buckle. Water resistant to 30m. 45mm titanium and steel case, transparent back, sapphire crystal, blue dial with gold gear train, Caliber UN-205 manual-winding movement with hour and minutes indicated by the rotation of the movement, winding by rotating the back bezel, and time set with the front bezel, approximately 7 days of power reserve, blue sailcloth strap with gold bar tack loop stitches, folding buckle. Water resistant to 30m. 45mm titanium and steel case, transparent back, sapphire crystal, blue dial with silver gear-train bridge, Caliber UN-205 manual-winding movement with hour and minutes indicated by the rotation of the movement, winding by rotating the back bezel, and time set with the front bezel, approximately 7 days of power reserve, blue sailcloth strap with silver bar tack loop stitches, folding buckle. Water resistant to 30m. 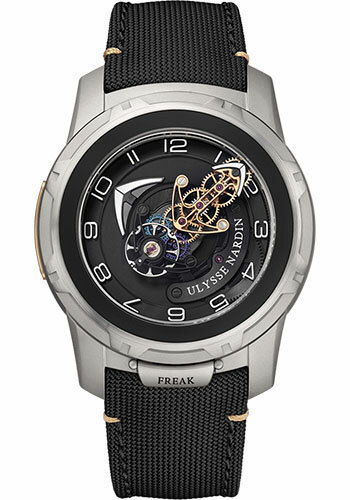 45mm black PVD treated titanium and steel case, transparent back, sapphire crystal, black dial with silver gear-train bridge, Caliber UN-205 manual-winding movement with hour and minutes indicated by the rotation of the movement, winding by rotating the back bezel, and time set with the front bezel, approximately 7 days of power reserve, black sailcloth strap with red bar tack loop stitches, folding buckle. Water resistant to 30m.